The skies seem to be brighter. The air seems cleaner, fresher and crisper. Its more pleasant to be outside vs having to run from building to car to home etc while constantly keeping over hydrated and SPF’d all day long. 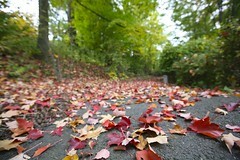 Oddly enough, I can’t wait to get outside and take more walks or rake the leaves in the fresh air and sunshine. Time to bust out the familiar and cozy sweaters, long sleeved tee’s and comfy jeans. As Rachel Ray used to say – its the time of year we can stop watching what we eat because we can hide underneath bulky fall clothing. Hey, its an excuse to go shopping right? How true is that especially since this is the time of year that meals become heartier – hello chili, hearty soups & stews! – as well as baked goods. Apple & pumpkin everything! Y’all know I’ve got the bundt cake thing down pat 😉 Then you have the onslaught of holidays – Thanksgiving, Hallowe’en, Christmas…..all holidays based on food. Mmm! I”m sure the list goes on….what are your favourite things about fall? Do you love it or hate it? I got bit by the baking bug the other day and have been jonesin’ yet upon a brief web search…I couldn’t find anything that tickled my fancy. Disappointed, I decided to focus on making a grocery list and started to take inventory of what was needed from the fridge. As I opened the fruit drawer, it hit me….I needed to buy more apples as the ones I found in there were starting to go past their prime. After a quick web search, I found a recipe for a fresh apple bundt cake. Excited that I had everything listed, I quickly got to baking. As I started following the recipe, I found myself getting more and more excited to see the end result. After all, this was my very first bundt cake – ever!